Home » Exercise » Are your goals SMART? Easy steps to plan for success. Do you have goals? Chances are, yes! Goal setting is an excellent motivational tool, but how we set them can make or break our success in reaching them. Vague statements like, “I will lose fat” or “I want to compete” may get us started, but it’s important to have firm goals with long-term and short-term objectives to keep us going. Otherwise we may end up losing motivation, derailing from our plan, and ultimately winding up exactly where we began. 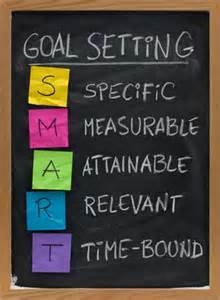 To get on the fast track to success, our goals must be SMART. That is, Specific, Measurable, Achievable, Realistic, and Time-bound. Why: Specific reasons for wanting to accomplish this goal. Where: Consider where you’ll be working toward this goal. Which: Identify requirements needed to meet the goal. Measurements provide feedback and let us know when a goal is complete. When we’re able to measure progress, we tend to stay on track, reach targets, and experience the exhilaration of achievement that further motivates us to continue working toward success. How will I know when this goal is accomplished? Goals need to be practical. The majority of us have probably tried to shed a few pounds at one time or another, and our success largely depends on whether we set a reasonable goal in the first place. Losing 20 pounds a week is unrealistic (we can thank diet pills for that mindset). Losing 2-4 pounds a week is more reasonable. Goals need to be ambitious, but setting them too far out of reach only sets us up for failure. Do I have the ability to reach this goal? How about the resources, time, or commitment? What are my limitations and how can I overcome them? Be honest. Setting unrealistic goals will only lead to frustration. Time frames provide structure. Rather than making the goal of someday competing in a bodybuilding competition, pick a date and go for it! Having an exact date in mind causes us to take action. The SMART method isn’t limited to fitness goals. Rather, it can (and should) be used for any ambition. Once we’ve established what we want, we can create goals beginning with long-term objectives followed by short-term goals. Long-term goals are things we want to accomplish within the year while short-term goals are these are daily, weekly, or monthly targets that keep us on track toward the long-term goal, much like stepping stones or rungs of a ladder. Remember to be reasonable with short-term targets, but don’t be afraid to aim high when thinking long-term. We expand our abilities to reach our ultimate goal with each short-term goal met, so shoot for the stars! ← Tis’ The Season To Get In Shape.